Richie McCaw insisted that Dan Carter is not the only New Zealander who will be determined to put on a show against Scotland at Murrayfield. Fly-half Carter returns from long-term injury to win his 102nd cap. He was just one of 13 changes to the All Blacks side that defeated England last weekend. "The guys who've been given their chance are pretty excited and I expect them to perform to a high standard," said captain McCaw. "There's no doubt that guys who've been in the squad for a while and have not had a start, whenever they're given their chance, they want to nail it so they return whether it is for the World Cup or the next game. "The times I've been here, regardless of what the scorelines have been, physically it's always been a tough old battle." "We've seen all year, when someone has been called upon, they've come in and done the job." Flanker McCaw will also be in unfamiliar territory, moving to blindside, having never previously worn the number six jersey for the All Blacks. He admitted he is excited to be "having a crack" at the role. He thinks that the All Blacks could also benefit from resting most of the players who "are a bit sore" following their match against England. However, the All Blacks record cap winner suggested that no player would be more motivated than Carter, as the 32-year-old makes his first start after nearly a year out through injury. "100 tests under your belt, once he gets out there, I'm sure that experience will help," said McCaw. "I just see the excitement of him running around like it is his first start in the team and he can't wait to get out there and hopefully we can make it easy for him." McCaw will be winning his 136th cap when he returns to his ancestral roots. "I always love coming to Scotland," he said. "Both sides of my family come from these parts." 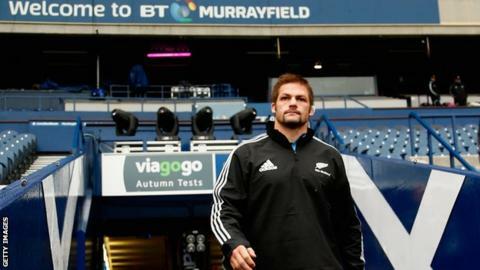 Scotland will be looking to build on their 41-31 win over Argentina last week but have yet to beat the All Blacks. "It is going to be a good challenge for us," added McCaw. "From our point of view, you can't take anything for granted and have to work for everything you get.